Progressive tension overload is the most important factor when it comes to building strength and size. It refers to progressively increasing tension levels in the muscle fibers over time. That is, lifting progressively heavier and heavier weights. Basically, your body will not change or improve unless you force it to. Unfortunately, most gyms only have weight plates starting at 2.5 lbs and sometimes only 5 lbs! The jump in weight is simply too high and results in bad programming. It can even lead to injuries! To force your muscles to adapt, you must provide a stimulus greater than that to which they have already adapted. The Iron Bull Fractional Plates allow weight increments of 1 pound to allow progressive overload on any exercise. And, while it may only seem like a tiny improvement, it's EXACTLY what you need to do n order to prove to your body that it needs to improve. If you want to get any degree of positive results from your workout routine, progressive overload is the absolute key. 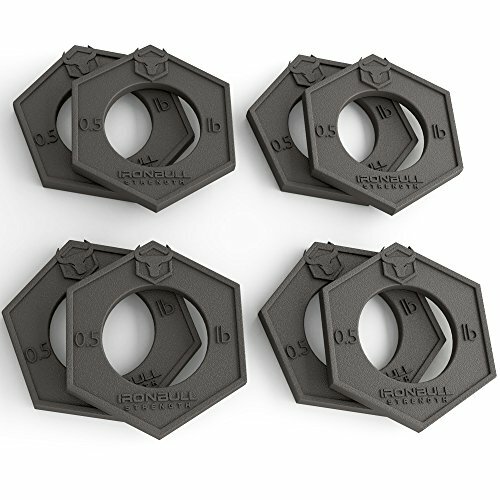 The Iron Bull Fractional Plates come in a kit of 8 plates allowing 1 lb increments, up to 4 lbs. They perfectly fill in the gap between having to use the same weight over and over again and increasing weight by too much and injuring yourself. Get yourself a kit of fractional plates now. You won't regret it. Use progressive overload to your advantage with this kit of 8 count, 0.5 pound fractional plates that fit any 2in Olympic barbells. By continuously increasing the demand placed on the body during training, progressively overloading your muscles, they will adapt by growing bigger and stronger so that you can handle this type of intense stimulus if and when it occurs again. Increase weight by 1 lb on any exercise and build more muscle and strength faster. Simply, by pushing and stressing the muscle to move more weight every workout, the body will do what it must to meet the demands placed on it. The muscle fibres will have no choice but to grow in size and strength. Progressive overload should be used at all levels of conditioning. Beginners need it to progress faster and avoid injury, intermediate lifters need it to stay motivated and keep pushing forward and experts need it to break through plateaus to achieve greater success. By setting yourself a new challenge every workout, you are also setting yourself up for greater intensity and motivation to push yourself further than your last training session. The Iron Bull Fractional Plates are made from high precision casting for accurate weight and E-Coat finish process for higher quality and durability. These fractional plates are designed to last you a lifetime. They have a great appearance and smooth finish. Kit comes with 8 x 0.5 lb weight plates.